Yoona has been chosen as the cover model for the January issue of Chinese magazine GRAZIA. She looks gorgeous on the cover, and you may take her appearance on the over for granted because she is one of the most popular k-pop idols who are loved by people all over the world. However, it's not that simple. Yoona's appearance on the cover of the famous Chinese magazine means so much. Korean artists and entertainers have had a hard time in China as the Chinese authorities imposed restrictions on Korean content in retaliation to the placement of a Terminal High Altitude Area Defense (THAAD) battery. After the restrictions, some of the popular singers, such as Psy and Hwang Chiyeol, appeared on Chinese shows with their faces blurred out. In some cases, their appearances were edited out altogether. China even blocked access to newly updated clips of South Korean music and dramas on the country's online video sharing platforms. However, the tension between Korean and China has recently begun to eased, and yeah, Yoona's appearance on the cover of the Chinese magazine has symbolic meaning. You know, it's the January issue of the magazine, and the magazine never chooses just anyone as the cover model for its January issue. So, Yoona's appearance on the cover of the magazine's January issue means the tension between Korean and China has really begun to eased and Yoona is now the most popular and influential k-pop star in the country. But Yoona is not the only k-pop star who has been chosen as the cover model for a famous Chinese magazine during a period of tension between Korea and China. In December, 2017, when Korean president Moon Jae In visited China and the tension between the two countries just began to be eased, Suzy appeared on the cover of Chinese magazine Cosmopolitan. It was the January issue of the magazine, and you know, the female k-pop star has been chosen as the cover model because she is as popular and influential k-pop star as Yoona in China. Suzy's appearance on the magazine had symbolic meaning too. The interesting thing is that SM and JYP Entertainment, home to Yoona and Suzy, have recently enjoyed significant rises in their stock prices. Their stock prices plummeted when the Chinese authorities began to impose restrictions on Korean content in 2017, but the prices turned around and are rising as the tension between Korea and China has begun to be eased. There could be various reasons for the price rises, but, yeah, Yoona and Suzy, two of the most popular k-pop stars in China played a considerable role in it. On the other hand, the stock price of YG Entertainment, one of the biggest k-pop agencies along with SM and JYP, didn't turn around yet. 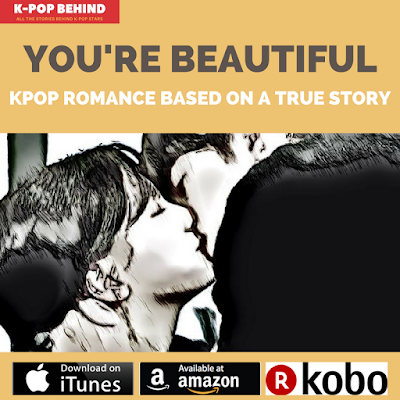 <You're Beautiful: Kpop Romance Based on a True Story> is now available on Amazon, iTunes and Kobo! Minjoo is a 16-year-old girl who has always dreamed of being a k-pop star. Fortunately, she passes her 21st audition and becomes a trainee of Fish Entertainment, one of the biggest k-pop agencies. There she meets two handsome trainees, Minho and Giho, both of whom like her. And she continues her efforts to realize her dream. However, she’s faced with an unexpected ordeal. Can Minjoo realize her dream by debuting as a k-pop idol? And will she be happy together with her boyfriend? This novel has been reconstituted based on a true story. The author has been working as a k-pop journalist since 2010 and has heard many stories regarding k-pop idols’ love and dating. He included the stories in the novel, and the book also contains unknown facts about the k-pop industry.